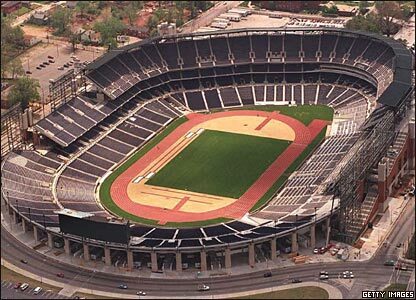 Construction Managers Atlanta Stadium Constructors (a joint venture of Beers Construction Co., HJ Russell Construction Co. and CD Moody Construction Co. Designed as the centerpiece of the 1996 Olympic Games, the Olympic Stadium did seat 85,000 people for Opening and Closing Ceremonies and the eight days of athletics competition. Groundbreaking for the striking new facility was held on 10 July 1993, with completion of the field of play scheduled for first quarter 1996. 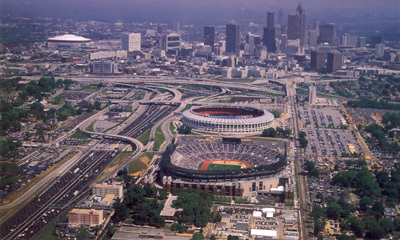 Approximate construction cost was $207 million, which included conversion of the stadium after the 1996 Games to a 45,000-seat baseball facility that will serve as the new home of the National League Atlanta Braves and destruction of Atlanta-Fulton County Stadium, the present home of the Braves. Adjacent to the Olympic Stadium and standing tall enough to be seen by every spectator in the stadium is the Olympic Cauldron -- the dramatic, free-standing structure being built to house the Olympic Flame during the Games. The Olympic Stadium is ACOG's single largest legacy to Atlanta and Georgia. The Atlanta Games were certainly the largest (a record 197 nations competed), most logistically complicated Olympics to date and perhaps the most hyped and overcomercialized as well. Despite all the troubles that organizers faced from computer scoring snafus and transportation problems to a horrific terrorist attack, these Olympics had some of the best stories ever. The Games began so joyously with Muhammed Ali, the world's best-known sports figure now stricken by illness, igniting the Olympic cauldron. Sadly, just eight days later terror was the prevailing mood after a terrorist's bomb ripped apart a peaceful Friday evening in Centennial Olympic Park. In the explosion, one women was killed, 111 were injured and the entire world was reminded of the terror and tragedy of Munich in 1972. As they did in '72, the games would go on. In track and field, Michael Johnson delivered on his much-anticipated, yet still startling, double in the 200 and 400 meters. One thing that many didn't foresee is that he would be matched by France's Marie-Jose Perec, who converted her own 200 - 400 double, albeit with much less attention. Carl Lewis pulled out one last bit of magic to win the long jump for the ninth gold medal of his amazing Olympic career. Donovan Bailey set a world record in the 100 and led Canada to a win over a faltering U.S. team in the 4x100 relay. The U.S. women's gymnastics squad took the team gold after Kerri Strug hobbled up and completed her final gutsy vault in the games most compelling moment. Swimmer Amy Van Dyken became the first American woman to win four golds in a single games. Ireland's Michelle Smith won 3 golds (and a bronze) of her own but her victories were somewhat tainted by controversy surrounding unproven charges of drug use. The USA faired well in team sports also. The men's basketball "Dream Team" was back, and, predictably, stomped the competition on their way back to the winner's podium. Also the U.S. women won gold at the Olympic debut of two sports: softball and soccer.